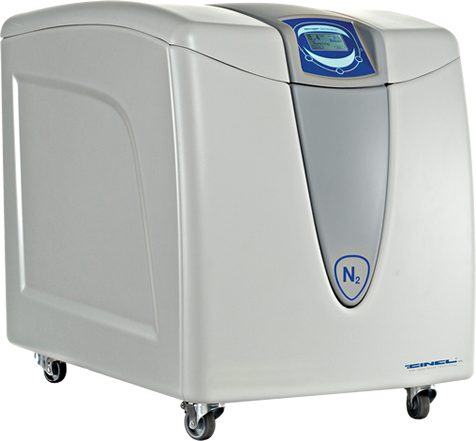 ZEFIRO Nitrogen Generator “MP” series is specifically designed to supply Nitrogen & Exhaust Air for the AGILENT MP-AES. The Nitrogen generator uses pressure swing adsorption technology (PSA) to produce nitrogen gas at specific purity required > 99,5%. This system uses carbon molecular sieve (CMS) which selectively adsorbs oxygen and residual water vapor molecules under high pressure, while allowing Nitrogen to pass through. The internal oil free air compressor which is firstly pre filtered provide also to the exhaust air flow which is treated by a drying filter.